Tibial plateau fractures were originally termed fender or bumper fractures due to their association with automobile impacts to the knee. However, the majority of these fractures are not caused by automobile impacts. Axial load injuries can also cause tibial plateau fractures. Lateral plateau fracture is the most common (75 %) as trauma results from valgus force, The Schatzker classification is used to describe these fractures. There are depression, split, split depression, and condylar subtypes. A Cross table lateral radiograph. 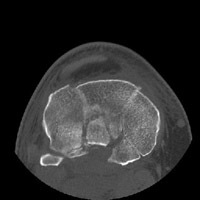 This demonstrates a comminuted fracture of the tibial plateau and a fat-blood interface in the suprapatellar bursa, known as a lipohemarthrosis. 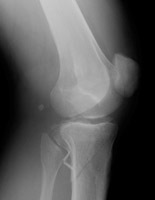 B Oblique radiograph of the knee. The fracture of the tibia is visualized. 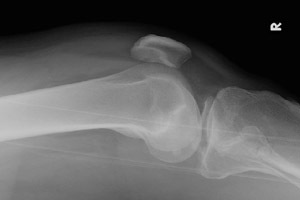 C AP radiograph of the knee. The fractures of the medial and lateral aspects of the tibial plateau are now easily visible. D Axial CT. This image through the tibial plateau demonstrates the extensive nature of the fracture involving both sides of the tibial plateau.